When you spot a whitehead in the mirror, it's tempting to think that you can pop your blemish and be done with it. In fact, though, most whiteheads go away on their own within a few days -- and popping them can cause more problems than it solves, according to "Seventeen" magazine's beauty department. Whiteheads occur when your hair follicles get clogged with bacteria from the surface of your skin and oil, which can come from your hair, cosmetics and your own oil-producing glands. The clog causes a bump to form on the surface of your skin, explains the beauty department at "Seventeen" magazine. When the pore in question is completely blocked, the resulting blemish is called a whitehead, and popping that whitehead may seem like the fastest way to make it disappear. When you squeeze a whitehead, the mixture of oil, debris and bacteria inside it spills onto the surrounding skin, causing more clogs and inflammation. At the same time, the ruptured skin can be permanently damaged, causing pitting, hyperpigmentation and scarring, explains dermatologist Roshini Rajapaksa in "Health" magazine. That means popping a whitehead can actually make your acne problem worse. 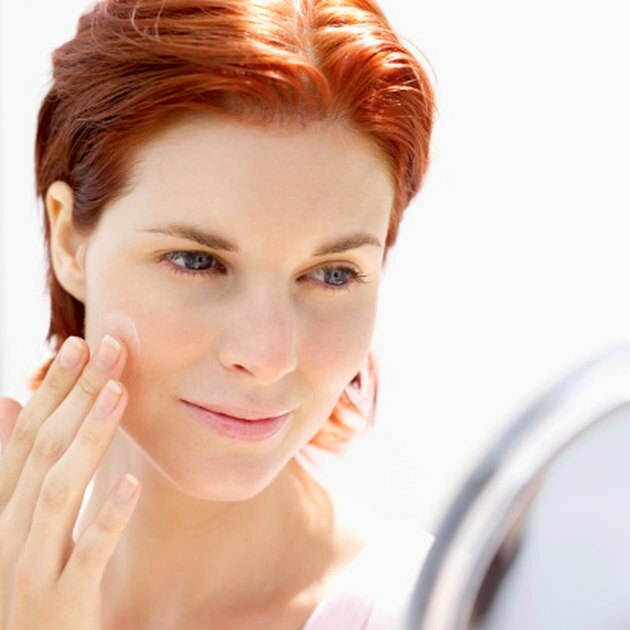 To help speed whiteheads on their way without popping them, use a gentle exfolitating cleanser twice a day to clean out pores and remove dead skin cells with the potential to clog your pores -- cleansers that contain chemical exfoliants that include salicylic acid or glycolic acid are good options. Spot treat whiteheads with benzoyl peroxide or salicylic acid to help heal infection, soothe redness and dry up your blemish. If you feel that you absolutely must pop your whitehead, use a hot compress to warm and soften your skin, then push gently on both sides of the pimple while wearing gauze bandages over your fingertips -- pus or clear fluid should come out, says Rajapaksa in "Health" magazine. Dab on a little antibiotic cream to prevent infection. If your pimple won't pop, leave it alone and try again later -- pushing too hard could leave a scar. Even better, call your dermatologist to request a cortisone injection, which can safely and effectively make most whiteheads disappear within 24 hours. If you think popping a whitehead will make it go away faster, think again. When you pop a whitehead, in addition to potentially infecting the surrounding area, you also force the bacteria and oil clogging your pores deeper into the hair follicle, making your whitehead more noticeable -- thanks to redness and inflammation -- and slower to heal, explains KidsHealth.org.